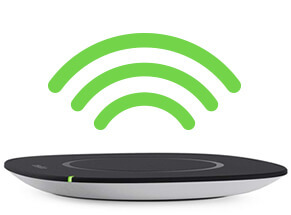 BOOST↑UP™ Qi™ Wireless Charging Pad (5W) is rated 2.8 out of 5 by 143. Qi is one of the wireless technologies on the market. It’s a popular option used by some of the industry’s leading smartphone manufacturers, including Apple and Samsung. 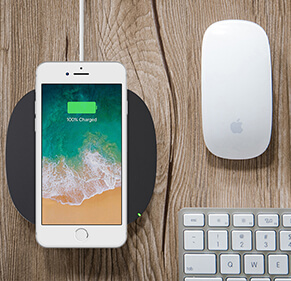 Some charging pads aren’t optimized for Qi and may charge slowly, overheat, or stop charging before your device fully powered up. 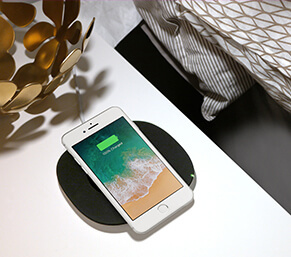 Engineered to be Qi compatible, the BOOST↑UP 5W Qi Wireless Charging Pad safely and fully charges phones, tablets and other accessories with Qi technology. 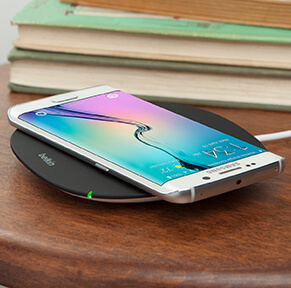 The Qi Wireless Charging Pad comes bundled with a Belkin Micro USB Cable and a 2-amp wall adapter. The wall adapter and cable may be used independently of the charging pad to charge any device with a micro-USB input. Rated 5 out of 5 by paulb from Simple Yet Effective! As easy as 1,2,3! Got the device out of the box, plugged it in, and dropped my iPhone X on the pad. It immediately began charging and the LED light on the pad illuminated and began blinking to indicate that the iPhone was charging. The pad is compatible with other wireless enabled devices too (as long as they are using the Qi standard). Overall, a simple design that functions as expected. Would recommend! Rated 5 out of 5 by ThisDude from Excellent and convenient! Just lay your phone on the pad and watch the light. You can quickly confirm it is charging. Most important it is easy quickly pick up your phone and go. No more burnt out charging ports. Rated 5 out of 5 by captainamerica1967 from Works Great I’ve had this charger for six months now, it charges my phone at about the same rate as the brick that came with the phone. I have used two heavy cases and the charger is unaffected by the thickness of either of those cases. I definitely recommend this charger. Rated 2 out of 5 by Lauren1235 from It works when it works but ... 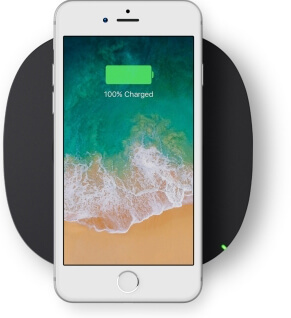 I purchased this wireless charging pad at my local Sprint store and was assured I would't regret it. BLAH. like I said in the title it works when it works but when it doesn't you unfortunately find out when you wake up late for work because your alarm didn't go off because your phone is still dead. I never had this issue with my traditional charger. I love the idea of this charger but some improvements need to be made. oh lastly I was told the phone would stop charging once it was full charged and that was also false. Maybe I got a shady salesman but either way I', not satisfied with this device. Rated 2 out of 5 by Danie from Its decent but Im not at all impressed I bought this around December 27th when I picked up the iPhoneXR from Sprint and was really excited but was immediately disappointed. What I like is the fact that I don't have to go through and purchase wall charges anymore by constantly unplugging my phone. 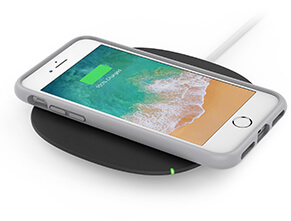 This is overshadowed by the fact that it charges extremely slow, and if your phone is even slightly moved out of the exact position (for example receiving a text or call while on vibrate) it stops charging all together. So in order for it to work somewhat properly, I have to take my phone out of the case, turn notifications and vibrate off, place it exactly right and hopefully when I wake up 6 hours later my phone is 75% charged. I really feel like I wasted my money b/c nothing about this is convenient or functional. Rated 5 out of 5 by Lulu71 from Easy to use I bought two of these a few weeks ago. Really enjoy using them. I just place them on top and go back to my usual routine. No connection plugs is great.